I’ve kind of become obsessed with almond flour lately. Like, really obsessed. I put it in everything! Its especially the best ingredient for nutritious desserts – just check out my peanut butter balls recipe, raw brownie cookie dough, or chocolate layered fudge bars and you’ll see what I mean. But the first time I ever used almond flour was to create a pancake recipe for a food video! I thought to myself – I really want people to love this video, so what’s always a winner? Answer: Pancakes! I mean, who doesn’t love pancakes?! Actually, there is one person. My husband is probably the single person on earth that I know that can turn down a pancake because it’s just not “his thing”. Somehow our marriage still works though! The internet is all the rage on almond flour pancakes these days. But the first time I tried making pancakes solely from almond flour it was way too grainy in texture. So I combined it with some oat flour to give it more of a light and fluffy cake-like texture – as every pancake should be. It worked out beautifully, I’m so in love with this recipe. And it’s SO ridiculously easy! You just throw all the ingredients in a blender and that’s pretty much it. I added some lemon zest and lemon juice for a fresh pop of flavor and its sooo delicious with some juicy blueberries. Lemon and blueberries are always a fabulous combo. Almond flour is great for diabetics as it is much lower in carbs than wheat flour or oats. So this is a great breakfast option if you are looking to control carb content! Regardless if your diabetic or not, almond flour also adds a boost of healthy fats and protein which help you keep you satisfied. 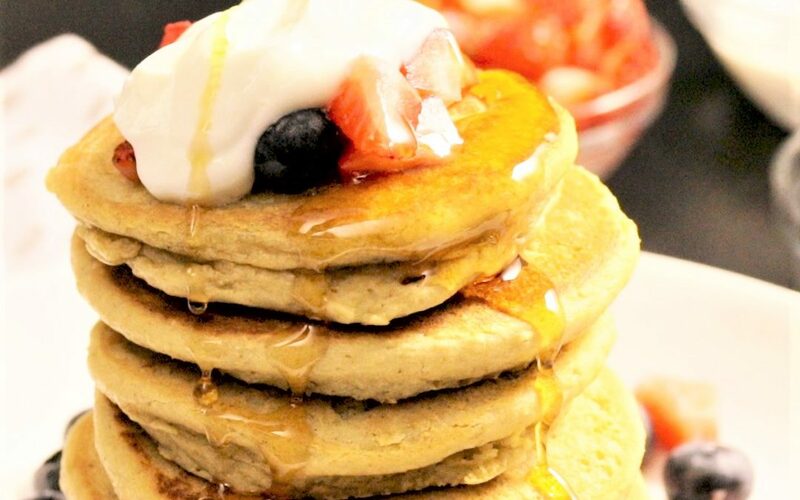 Enjoy the video below which shows you exactly how to make these pancakes! This video was filmed in collaboration with Kettle & Cord. Place rolled oats in the blender and blend until it is flour-like consistency. Add the almond flour, almond milk, eggs, lemon zest and juice, baking powder, baking soda, and maple syrup. Blend 30 seconds. Heat a griddle or pan to medium heat. Coat with butter or some cooking spray. Pour ¼ cup batter at a time and cook until batter starts to bubble and the sides start to look firm and golden brown. About 1 to 2 minutes. Flip and cook additional minute. Serve with fresh blueberries, Greek yogurt, and maple syrup. Enjoy!